Offering private, standalone cottages on Mobor Beach, Bamboo House also overlooks River Sal. The cottages are built with and fitted with bamboo furnishings. They also feature private bathroom facilities. 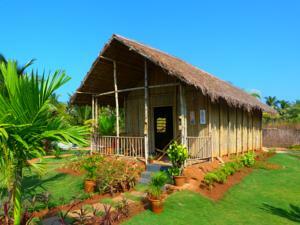 Bamboo House Goa is located about 32 km from Dabolim Airport and 18 km from Madgaon Railway Station. An airport shuttle service is provided at an extra cost. All cottages come with a cosy patio and facilities such as a desk, a fan and a mosquito net. They also have a comfortable seating area. Services such as luggage storage and laundry are provided on request. There is also a tour desk which helps guests organise excursions to popular tourist sights. Free! One child under 5 years stays free of charge when using existing beds. One older child or adult is charged INR 1000 per night and person in an extra bed. Maximum capacity of extra beds in a room is 1. There is no capacity for cots in the room. Any type of extra bed or child's cot/crib is upon request and needs to be confirmed by the hotel. Supplements will not be calculated automatically in the total costs and have to be paid separately in the hotel.